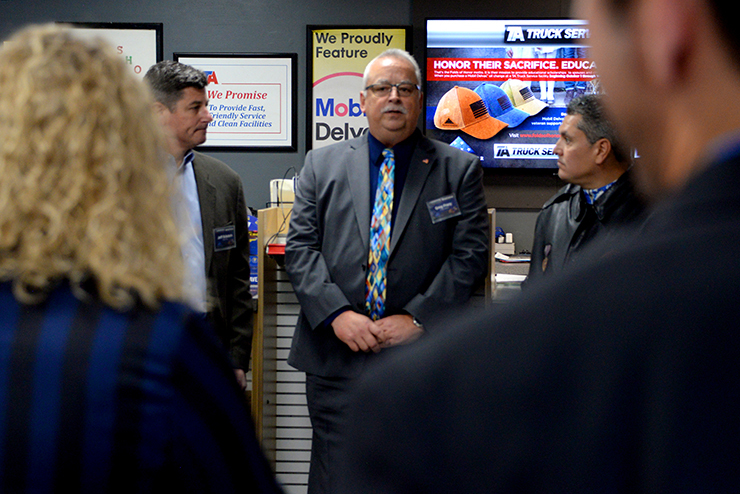 On Nov. 15, TA Truck Service in Lodi, Ohio proudly hosted Major Edward Pulido U.S. Army (Ret. ), Sr. VP Public Relations and Military Affairs for Folds of Honor, for a check presentation on behalf of our professional driver customers. 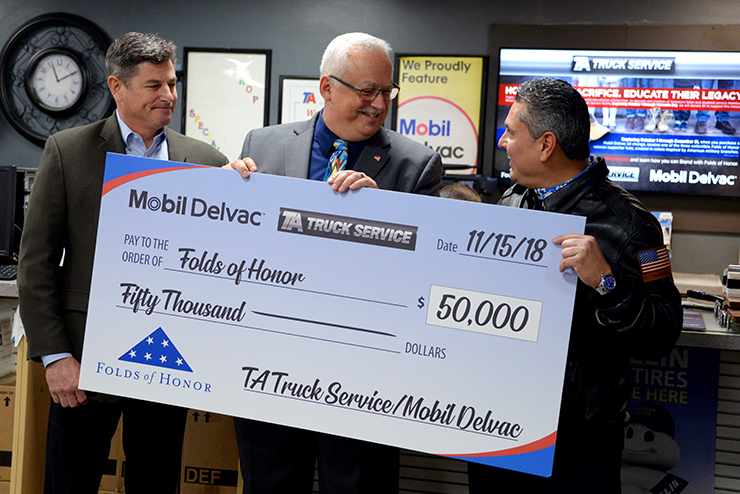 Beginning on Oct. 1 through Nov. 13, TA Truck Service partnered with Mobil Delvac to donate $5 from every Mobil Delvac oil change purchased at a TA Truck Service facility to Folds of Honor – up to $50,000. Thanks to support from our customers, we were able to reach that $50,000 goal and present the check to Major Ed. 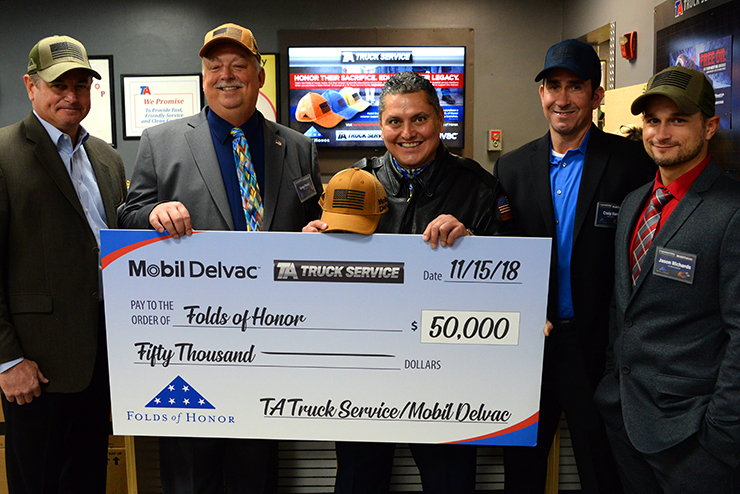 After touring the TA Truck Service Training Center and Lodi site, Major Ed, along with representatives from TA Truck Service and Mobil Delvac gathered to share a little bit about the importance of the Folds of Honor mission, the generosity of our customers and of course to present the check. 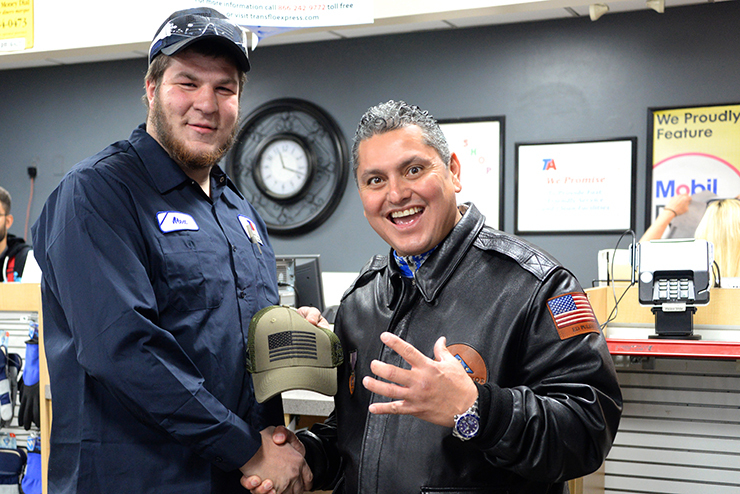 Along with their $5 donation, professional drivers received one of three collectible veterans supporter hats, designed in colors inspired by the branches of the U.S. military, with their oil change purchase. Attendees at the presentation proudly donned theirs. After the presentation, Major Ed even made time to personally sign hats for veteran professional drivers and TA Truck Service technicians in attendance. 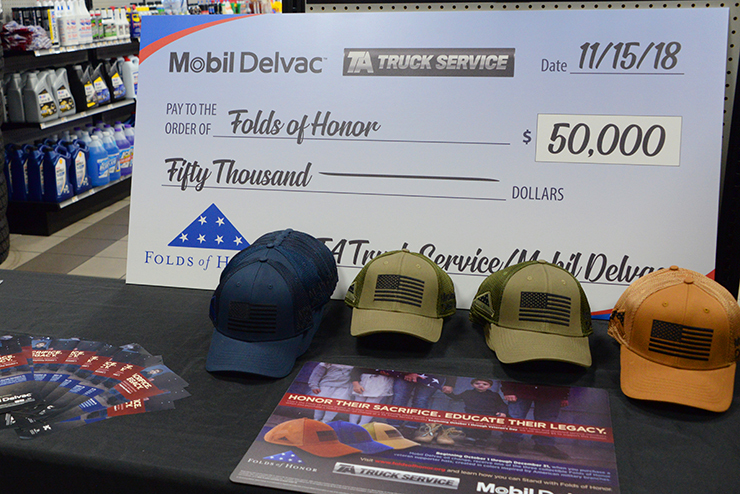 This is not the first time that TA Truck Service has partnered with Mobil Delvac to support Folds of Honor. 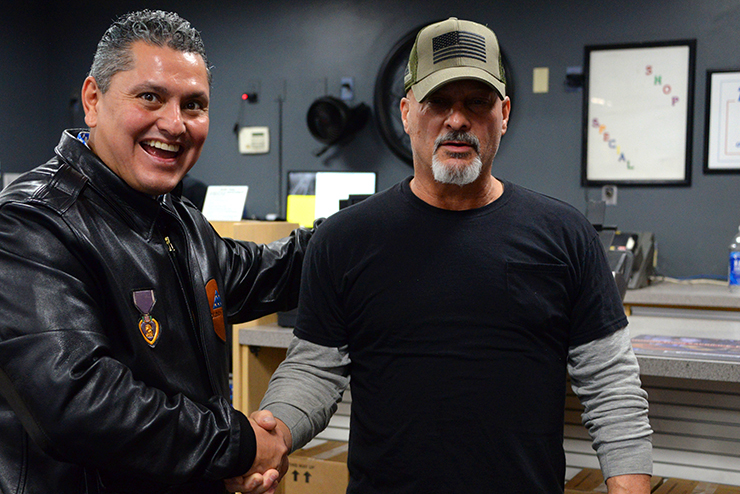 In 2017, when we announced we were partnering to support Folds of Honor and debuted the original hat, the response from professional drivers was overwhelming. Pictures of veterans that are now professional drivers or TA Truck Service employees wearing their hats flooded inboxes at our corporate headquarters. Many professional drivers reached out through social media, customer service inquiries and their fleet representation to see how they could stand with us and receive one of these hats. This year, we built upon last year’s success and created hats in two new colors for professional drivers to collect. We also had the opportunity to create a short video, featuring drag racer Greg Carrillo and his “American flag burnout.” The video was incredibly popular on social media, and we received multiple requests to have the video playing at our sites. 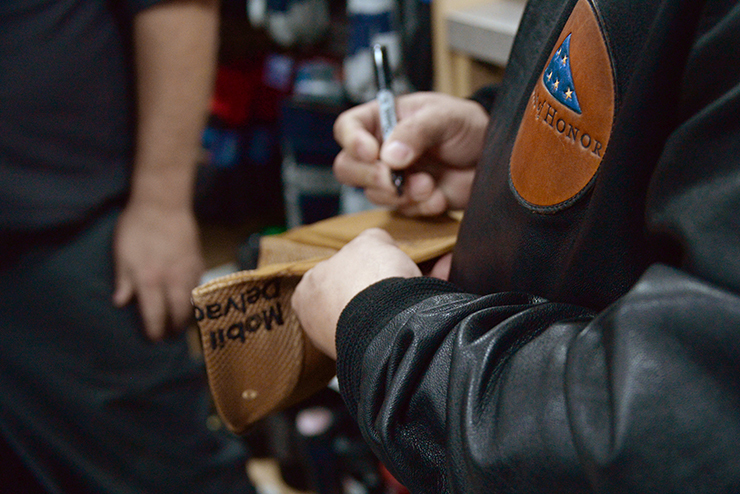 Although the hats and videos are fun, it all comes down to supporting the Folds of Honor mission. Folds of Honor is a well-established organization with outstanding leadership and respected credentials and their mission to provide educational scholarships to the spouses and children of America’s fallen and disabled service-members is truly admirable. TravelCenters of America has a long working relationship with military organizations, and Folds of Honor is an organization that more than one of our departments has worked with. That is because of the strong ties between the professional truck driving industry and the military community. According to TruckersNews, nearly one million military veterans are part of America’s trucking industry and its related fields. 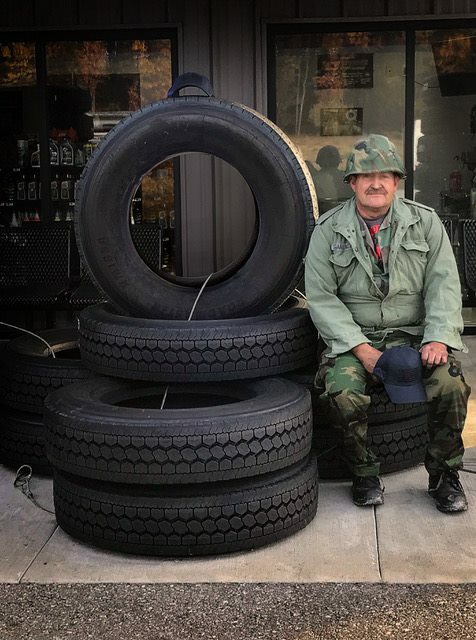 Many of our technicians and site employees also served in the military. With veterans being a crucial part of our operations, we were honored to give back and help support their families through Folds of Honor. The need is definitely there. According to the 2017-2018 Folds of Honor Factsheet, there are more than one million disabled and fallen service members affected by war and subsequently nearly two million dependents of military heroes that are adversely affected by war. The cost to provide educational scholarships to the dependents of all fallen and service members would be more than $9 billion. Although they have not reached that goal yet, Folds of Honor has awarded nearly 20,000 educational scholarships since its inception in 2007. 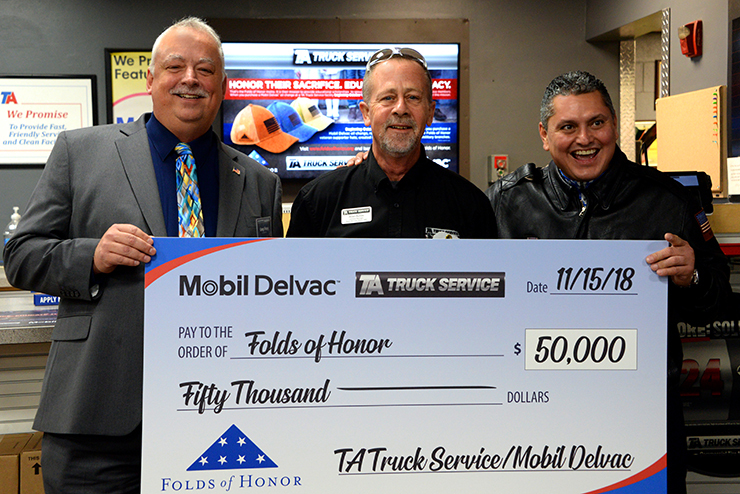 In 2017 alone, Folds of Honor supporters like TA Truck Service and Mobil Delvac customers helped facilitate 3,509 total scholarships, with 2,416 of those being for higher education and 1,093 focused on children’s education. Folds of Honor has awarded scholarships in all 50 states, as well as Guam, Puerto Rich, Italy, Australia, the Philippines, Ecuador and Japan. Visit the Folds of Honor website to learn more about how you can stand with us in providing education for family members of America’s fallen and disabled service members. Plus, be sure to collect all three colors of our 2018 Folds of Honor Veteran Supporter hat. We will continue to distribute them with the purchase of a Mobil Delvac oil change through the end of the year, while supplies last. 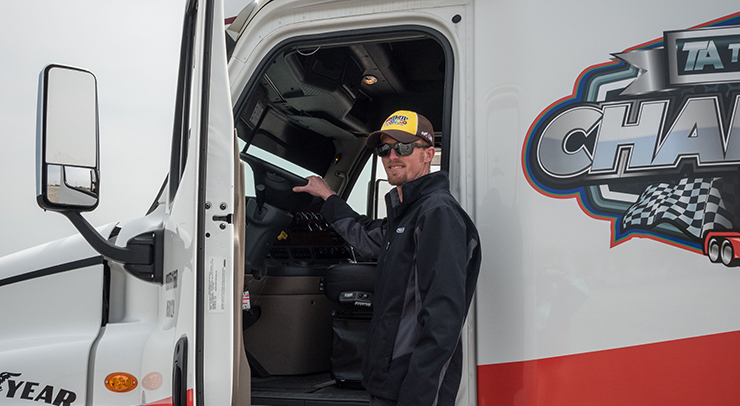 Meet the TA Truck Service TMC SuperTech team and see which awards they took home.